Remember how last week I got excited because I had a few contractions and thought labor was coming? That's nothing. A couple days ago I had consistent contractions for about 4 hours (7-10 minutes apart). If that's not enough to get your hopes up, I don't know what is. The problem was that they were mild (I guess - I'm expecting to not be able to talk through the real ones) compared to what "real" contractions should be. I bounced on my exercise ball, ate about 1000 otter pops, and notified Conrad each time I felt one. We went for a walk to keep them coming, and we finally decided to go to bed and just see what happened. 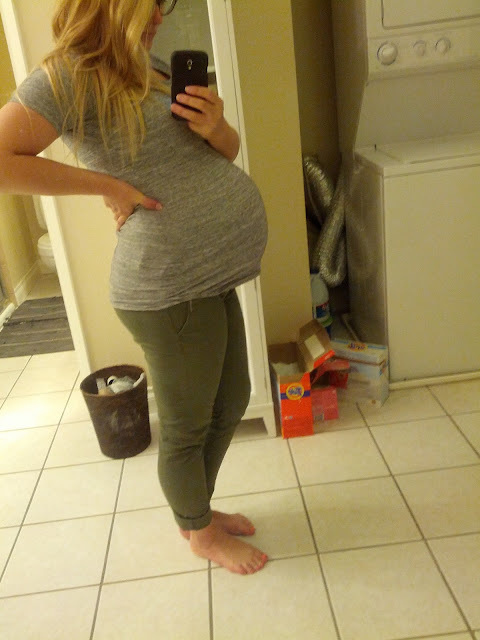 I woke up 3 or 4 times throughout the night due to one or two big ones, but they were much further apart, and when I woke up I was still pregnant. Each time I shave my legs (like for the last two months) I'm convinced it will be my last time, but it never is. Granted, it takes a significant amount of effort and some serious grunting to get the job done, but I'm still somehow able to shave those gams, two weeks away from labor. Never thought I'd need to be proud of myself for that. I thought I might escape pregnancy with only a few stretch marks on my love handles, and while those haven't gotten super crazy, I just recently sprouted a couple light ones on the front of my belly, just to the left of my belly button. They're not the purple ones that make you think maybe you tussled with a bear while you were sleeping, they're a really light pink. I'm convinced that if I give birth this week, those things won't even be showing by September. Things are really finalizing over here. Our new couch came, we got our crib mattress, his dresser is all set up and stocked, and I'm doing a Costco run today to stock up on maxi pads, toothbrushes, and basic groceries. If there's anything you think I MUST stock up on, let me know! I still don't know this child's name. I thought I would by now, but I just... don't. I expected to feel like he already had a name and we would just know it. It would come to us in some vision and we would immediately know "this is our child's name." Not the case. I feel like it's some secret that's being kept from us and we have to guess it right. No pressure. He's only going to be known by this word for the rest of his life. NBD. If I have my feet propped up and I cross them, I get a crazy deep dent in my leg from the pressure. Can you say swelling? Please don't spread to my face, please don't spread to my face. What sizes of diapers should I stock up on? I have some newborn ones already, but I don't know how many I'll need or how quickly babies tend to grow out of them. How did you finally decide on your baby's name? How soon after the birth should birth announcements be sent out? And in that vein, how soon after birth should you do a newborn/family photo shoot? I want to catch the froggy-legs on camera before they go away forever, but I also don't want to still be swollen and sore from giving birth. My little guy stayed in size 2 and 3 diapers the longest so far (now he's in 4's until...?). We chose to do birth announcements and family pictures shortly after our boy's blessing. That way we could could slip a picture of our boy in his blessing outfit in with the birth announcement for family and friends to see. Plus, by about 6 weeks out (when we did the blessing) I was feeling MUCH better and the swelling had gone down significantly, so pictures didn't feel so awkward. you will probably be getting newborn diapers from the hospital so you'll have enough to get you through. you will probably use them for at least a few weeks. you should see your baby and then maybe the name will come to you! we always went in with a few options and decided after having the baby. Madeline was 8lbs 11oz at birth and we only used one small pack (around 30?) of newborn diapers. We exchanged the rest for 1s. She's been in 2s for about 7 weeks now (since 8 weeks old) and is already coming close to growing out of them!!! But, since she goes through ~10/day, we still needed lots. I've heard they're in 3s for the longest. I'd get a box of newborns, and a bunch of 1s. Hope your baby makes his appearance soon!!!! stalk up on A LOT of newborn diapers! my baby just hit his two month mark & barely has graduated out of newborns. & he was 7.7 when he was born, so normal size! as soon as my husband & i found out i was pregnant, we both had agreed on the names holden & cedar, but i wouldn't choose his name until i met him first. i thought when he was born i would instantly know which was his name, that was not the case! it took us until the morning i left the hospital to finally settle on a name because once he was born it wasn't just cedar & holden we were picking between, but cedar, holden, oliver, tanner, finn.... the list kept growing & everyone had an opinion! so we waited until it was just my husband & i & we were filling out his birth certificate & we both wanted it to be cedar, even though the majority hated it. but the name fits him perfectly. so truly, don't listen to other people because it's your baby & you get to pick the name, if they don't like it, they'll just have to get used to it! we took newborn/family pictures when he was a week old, i wanted to do them as quickly as possible to capture his tiny babyness before he started to change & grow! so in my opinion, soonest is best, even if you don't feel your cutest, it's whats real & it's such a happy time! i love our pictures, they came out perfectly. we weren't planning on taking any family pictures that day, just photos of cedar but the photographer started taking some lifestyle shots of us & they are some of my absolute favorite. && i don't know the norm for birth announcements, but i'm sending his our this month & he's 2 months old now. hope any of this is helpful! can't wait to see what your little one looks like! Your such a cute pregnant gal!! !